Google is also rolling out an update for for Gmail desktop. It will now suggest your Google+ connections as recipients when writing a new email. And in a really cool way too, read on. Your email address is only shared with the people you want to share it with. Your email address isn’t visible to a Google+ connection unless you send that person an email. The same with the other person’s email address, it’s not visible until he or she sends an email to you. 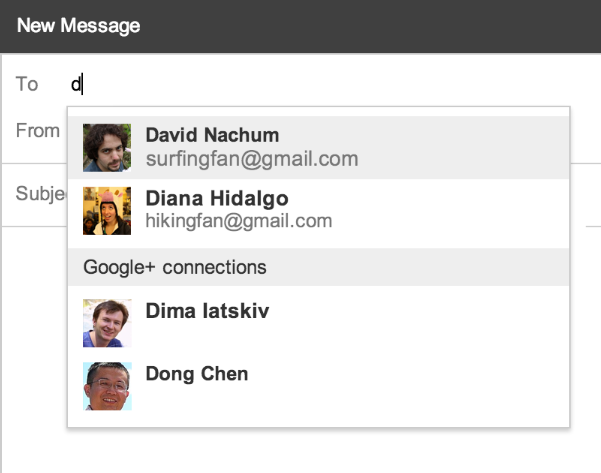 With this new update of Gmail, you can control if people can contact you this way with a new setting in Gmail. Emailing Google+ connections also takes advantage of Gmail’s new inbox’s categories. When someone in your circles emails you, the email will appear in the Primary category. But if you don’t have them in your circles, it will be filtered into the Social category (if enabled) and they’ll only be able start another conversation with you if you respond or add them to your circles. This is really awesome, I live by Gmail, and love to get emails, my whole online life is based on Gmail. This new update is rolling out over the next couple of days to all users that uses both Gmail and Google+. You will get an email from Google with information and a link when it’s available for you.